How Often Should You Give a Dog a Bath? Grooming your pooch is an often enjoyable part of owning a dog. When the activity is a positive one for your canine companion, he'll be more likely to let you do it more often. While for some dogs a good brushing is all they really need. For others a weekly shampooing or a bath once every six weeks is a good guideline. Keep watch for signs of irritation in your dog's skin and talk to a vet if you have concerns. Dogs who are mostly inside require fewer baths than outdoor dogs. For animal guardians, the reasons for a bath usually are obvious. Time outside in the dirt, mud, puddles and playing with other canines can result in a dirty coat and foul odor. Some breeds need a good shampooing to maintain luster in the coat. Whether your dog's hair is curly, long, coarse or thick can determine how dirty your dog gets. If your dog has fleas or mites, talk to your vet about the best way to get rid of them. While a bath might do the trick, in some cases it is a temporary solution. 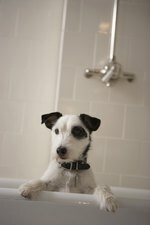 The American Society for the Prevention of Cruelty to Animals says the frequency of baths depends on the type of breed. The organization says too many baths can result in skin irritation and flaking. The ASPCA recommends speaking to your veterinarian to set a bathing schedule.